Given this high level of interest, I figure a “canoe carping” post is in order. Historically, of course, canoes and fishing go hand in hand. Most anglers at one time or another have spent time putzing around a local lake or pond in an Old Town or Mad River, casting to weed beds and pockets of cattails for 'gills and bass. And who among us hasn’t experienced the thrill of watching several hundred dollars worth of fishing gear disappear into the depths of our (formerly) favorite lake after dumping our canoe in the wake of a passing luxury cruiser? So it’s only natural that the canoe would eventually find its way into the carp angler’s world. And frankly, from a carp fishing perspective, these boats are ideal. They carry a low profiles, draft little water, and are in general stealthy as hell. That said though, it’s not as simple as jumping in your canoe, paddling out to the mud flats and catching carp. Well, ok, maybe it is that simple, but there are at least a few things to consider. A canoe properly outfitted for carping. 2. Be able to stop instantly. 3. Be prepared to cast immediately and accurately. 4. Have beer and snacks on hand for the instances where you screw up one of the above three. Moving slowly is important in all carp fishing, but especially in conditions wherein the fish aren't readily visible. 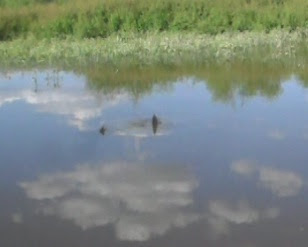 If the carp is in extremely shallow water with its tail waving above the surface - that's one thing, but if it's in a couple of feet or more of water, especially stained and/or choppy water - that's another ballgame because you probably won't see this fish until you are right on top of it. Canoes are stealth machines and it's entirely possible to manuever undetected to within a few feet of a feeding carp. If you zip along too quickly, you will be on top of that carp before you realize it, although the carp is guaranteed to realize it almost immediately. Cue the beer and snacks. A couple of carp tailing just off my bow in this truly poor quality photo. So paddle s-l-o-w-l-y through carp water. You cannot overdo this. I usually paddle a foot or two and then stop to scan the water. Then move forward another few feet, and so on. I spend a lot of time on the carp flats simply sitting and watching. It's not unusual to see the faint tip of a tail waving in and out of view just beneath the surface, or notice a faint shadow slowly take shape in the murky water - things I might have missed had I charged right on through. So put the paddle in your lap frequently and have a look around. I guarantee you that you'll double the number of shots you get at fish simply by being deliberate and patient. And speaking of paddles, be careful. I’ve probably spooked more fish with crap paddle handling than anything else. Sloppy pulls slosh water around on the surface and announce your arrival to every fish within a hundred feet. Long slow, shallow strokes are the way to go, the slower the better. Or better yet,dispense with the paddle once you're in the vicinity of fish and use a push-pole. A push-pole barely causes a ripple and is a much stealthier option. The paddle itself makes a serviceable pole, but I recommend you use the real deal. A pole can give you the extra leverage you need to free yourself when you run aground in extremely shallow water, or to push your way through a weedbed or through brush. Doesn't have to be fancy -I made an excellent push-pole from some spare PVC I had in my garage. Five foot PVC push-pole with padding. So again, be slow. Be methodical. Be patient. If you can get this part right, you are at least in the game and will get your chances to nail some fish. That's going to be it for now. I thought I would be able to get this all in one post, but now it's obvious to me that a topic with the gravitas of canoe carping is worthy of two, maybe even three, posts. In Part II, I'll cover the last three rules of canoe carping and provide important insights, for example why an IPA is a far better choice than say, a stout or porter, out on the carp flats in July. I would go with a nice red ale in July... or anytime for that matter. Interesting post. I assume that my sit on top kayak would be interchangeable with a canoe, so maybe I can learn something if I ever find a carp hole near me. I've done this! Your points are right on....especially #4. ;-) But man, when it works....carping from a canoe is awesome. And quite a handy tool to have in one's arsenal. Jay, I'm sure a sit-on-top would work very well. As would the ale. Yep, you're spot on Erin. Once you have that canoe mojo workin', it's deadly to carp. That is a pretty sweet canoe you got there!Defenitely on the list (long list) of things to try. It's a pretty good ride McTage. It's a Nucanoe and I think those dudes must have been thinking about carp when they designed it. Nice post. I carp from my kayak all summer long. It is especially effective in muddy water. One thing I do on breezy days is put a very light drag anchor off the stern--5-6 Oz or so--and move with the wind at my back. It's not much effort to drag it along, and stops me quickly when I stop paddling, so I don't run over fish. Thanks lowbrow. Appreciate the comment. Good tip about the light anchor. I'm going to do a second part to this post and will talk a little about using anchors. I'd like to include your tip if you don't mind.